Sunmin Animation (also known as Sunmin Image Pictures, or SMIP for short) is a South Korean Animation studio. It was founded in 1990 as Artplus. 101 Dalmatians: The Series (6 episodes) List "Easy on The Lies", "Dog's Best Friend", "Out to Launch", "Cadpig Behind Bars", "The Maltese Chicken", "Channels"
Ben 10 (23 episodes plus The Movie)List "And Then There Were 10", "Permanent Retirement", "Kevin 11", "The Alliance", "Lucky Girl", "Side Effects", "Truth", "Framed", "Grudge Match", "Camp Fear", "They Lurk Below", "Ghostfreaked Out", "Back With a Vengeance", "Ben 10,000", "Merry Christmas", "Game Over", "Super Alien Hero Buddy Adventures", "The Unnaturals", "The Return", "Don't Drink the Water", "Ben 4 Good Buddy", "Ken 10", "Ben 10 vs. Negative 10 Part 1", and "Ben 10: Secret of the Omnitrix". Ben 10 (2016) (some episodes by Mua Film instead) (18 episodes)List "Waterfilter", "The Ring Leader", "The Filth", "Freaky Gwen Ben", "Animo Farm", "Clown College", "Ben 24hrs", "Shhh! ", "Brief Career of Lucky Girl", "Adventures in Babysitting", "Steam is the Word", "Bright Lights, Black Hearts", "Recipe for Disaster", "Story, Bored", "Xingo", "The Beast Inside", "Out to Launch" and "Battle at Biggie Box". Buzz Lightyear of Star Command (7 episodes)List "The Taking of PC-7", "Shiv Katall", "Head Case", "Haunted Moon", "Lone Wolf", "Planet of the Lost", "Good Ol' Buzz"
Gargoyles (2 episodes) List "Heritage", "The New Olympians"
Hercules: The Series (8 episodes)List "Hercules and the River Styx", "Hercules and the Pool Party", "Hercules and the Owl of Athens", "Hercules and the Drama Festival", "Hercules and the Caledonian Boar", "Hercules and the Big Games", "Hercules and the Complex Electra", "Hercules and the Green-Eyed Monster"
Jungle Cubs (three shorts)List "The Great Kaadini", "How the Panther Lost Its Roar", and one from "Bare Necessities/Mondo Mungo"
Stripperella (With Wang Film Productions and Mook DLE, three episodes)List "Beauty and the Obese, Parts 1 & 2", "The Wrath of Klinko"
Wacky Races (2017) (1 episode)List "My Fair Tiny"
The Zeta Project (3 episodes)List "Hunt in the Hub", "Ro's Gift", "On the Wire"
An episode of Gargoyles was guilty of this. 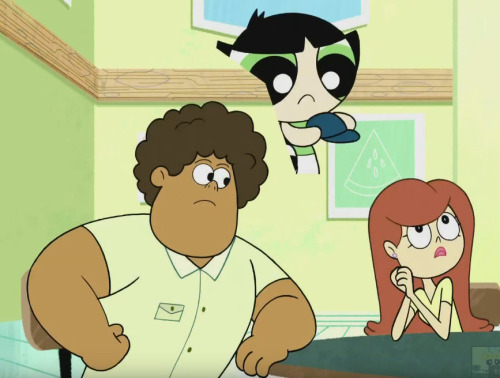 The Powerpuff Girls (2016) was notorious for its constant ◊ animation ◊ flubs ◊ during its first season. OK K.O.! Let's Be Heroes tends to do this a lot with facial expressions for the characters, albeit intentionally. Often worked with Epoch Ink. 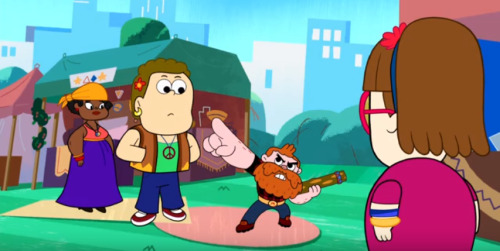 While Cartoon Network has used them to animate their shows created or based on shows created by Man of Action since the mid 2000's beginning with the first Ben 10 series, they have been using them more frequently for animating other projects since the mid 2010's such as Steven Universe, the Powerpuff Girls reboot, and a majority of their recent pilots (EX: Infinity Train, Twelve Forever).